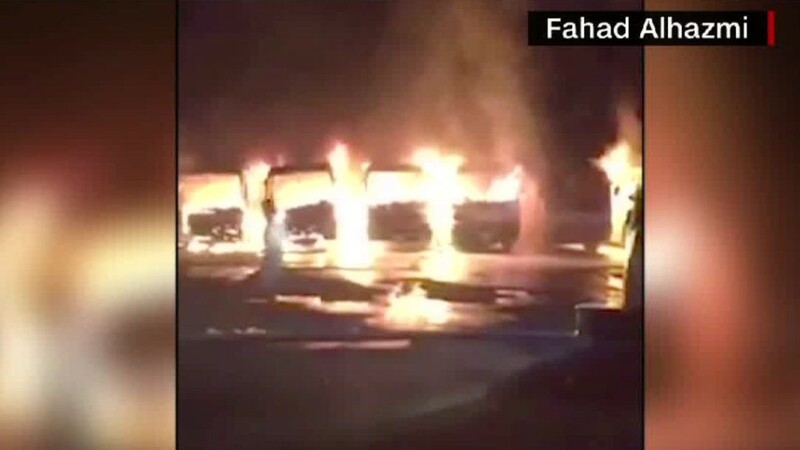 Here's a rare sight in Saudi Arabia: Protesters setting buses on fire. The Saudi Binladin Group, a massive construction company founded by the father of the late al Qaeda leader Osama bin Laden, has laid off at least 50,000 workers, according to local press reports. The job cuts come as the Saudi government has delayed payment to construction firms and cut spending to grapple with the plunging price of oil, which makes up three-quarters of the government's revenue. Saudi-based newspaper al-Watan reported the Binladin Group terminated the contracts of 50,000 workers -- mostly foreigners -- and has given them permanent exit visas to leave the country. Some workers refused to leave the kingdom because they claim the company has not paid them for months, the paper reported. The Saudi military confirmed to al-Watan that protesting workers torched seven buses in Mecca -- a rare sight in Saudi Arabia, which Human Rights Watch has criticized for cracking down on free speech and imprisoning peaceful dissidents. The layoffs are on top of the 15,000 workers cut last year after the Binladin Group's contracts were frozen when a crane collapsed at Mecca's Grand Mosque last year. The incident killed more than 100 people and the company was involved in the expansion project. The Binladin Group, which at times has had close ties to the Saudi royal family, did not return multiple requests for comment from CNNMoney. However, the company told Bloomberg News that dismissed workers received "full compensation" and described the job cuts as "normal routine" when projects are completed or near completion. The Binladin Group is one of the biggest construction companies in the Middle East and is the main contractor for the Kingdom Tower, the $1.23 billion project that is striving to become the world's tallest building. The protests and mass layoffs are a sign of how Saudi Arabia's efforts to cut government spending could back fire by sparking civil unrest. "The period forward in Saudi Arabia is going to be rocky. You are going to see the possibility of social demands bubbling over," said Emily Hawthorne, Middle East analyst at consultancy Stratfor. Not only is the Saudi government slashing spending, but it has also cut back on subsidies, resulting in a huge gas price hike for Saudi citizens. Hawthorne stressed that she doesn't think "massive violent protests" are likely in Saudi Arabia because the kingdom's security forces are well placed to contain uprisings. Still, the Binladin Group protests and layoffs come just a week after the Saudi government rolled out its vision for easing the country off its addiction to oil by diversifying the economy. That vision, announced to much fanfare, was aimed at reassuring the Saudi public and foreign investors about the way forward in this era of cheap oil. That's why Hawthorne argues the timing of the Binladin Group layoffs are "embarrassing" to the kingdom. "It's clear the government's plans are not going to shield the negative effect of economic reform from Saudis -- despite all the promises the government makes," she said.